"Can I transfer music from my ipod to my iphone? – I have an iPod touch generation one (without the cammera) and I have over 30 music albums on the ipod. the computer that I copyed the cd’s too is no longer living. My question is: can I transfer music from my ipod to my iphone 4/s? I have tryed to click and drag them from the ipod into itunes but it wont allow me to." 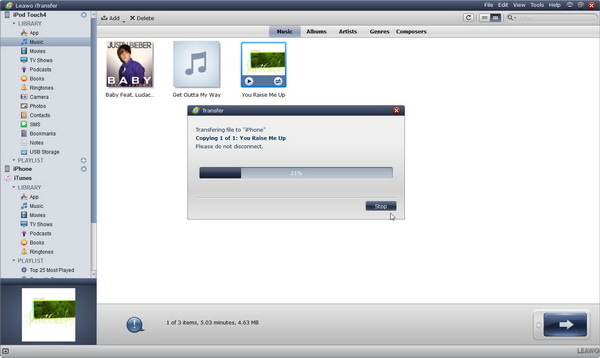 If you want to transfer music from iPod to iPhone, iTunes is the default solution provided by Apple to help you do so. You could make use of iTunes to back up and transfer music from iPod to iPhone easily. However, as we all know that iTunes only helps you transfer purchased music files from iPod to iPhone, what will you do to transfer music from iPod to iPhone that are not purchased from iTunes music store? This post will show you how to transfer music from iPod to iPhone with iTunes and without iTunes. It will not be difficutlt to transfer music from iPod to iPhone with iTunes. However, we should kee this in mind: iTunes only allows people to transfer purchased music from iPod to iPhone. That is to say, you are able to transfer the purchased albums back to iTunes Music Library, and then sync to your iPhone again. 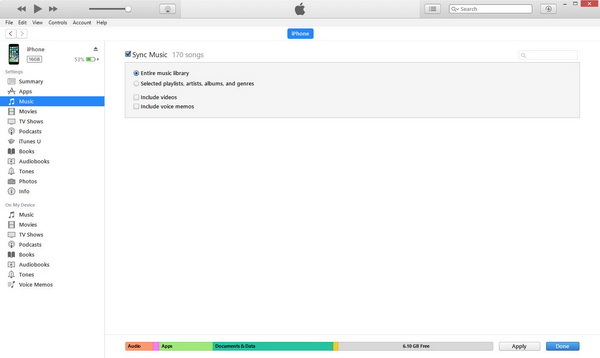 Syncing files from one iOS device to another is actually not hard to understand, but iTunes will erase all the albums and playlists in your target iOS device when you sync music. That’s to say, if you want to transfer music from iPod to iPhone with iTunes, all music tracks in target iPhone will be erased. There are 2 methods for you to transfer music from iPod to iPhone with iTunes that are purchased. If you’re a loyal iTunes customer, and you have media purchases tied to your account, you can download music while avoiding the desktop app entirely. Provided your device is signed in to the same Apple ID you used to buy your music, you can simply open the iTunes Store app on your iPhone or iPad and head to More > Purchased > Music to see your catalogue. Plug in iPod to computer and open iTunes. Plug in your iPhone with computer, open your iPhone device and go to "Music > Sync Music" option. 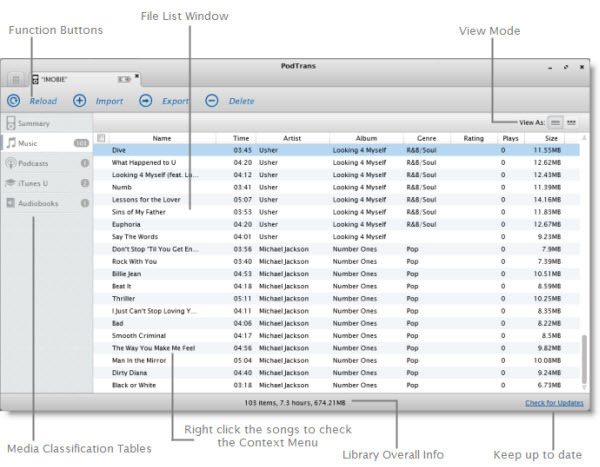 You could then choose to sync entire music library or selected playlists, artists, albums and genres as you like. Also, you could determine to include video and voice memos or not. There are 2 big disadvantages for you to transfer music from iPod to iPhone with iTunes: you could only transfer purchased music from iPod to iPhone with iTunes, and with iTunes, the music library in target iPhone device would be totally erased. If you want to transfer nonpurchased music from iPod to iPhone and keep iPhone music library not erased, you need to transfer music from iPod to iPhone without iTunes but some 3rd-party iPod music transfer app. As mentioned above, 3rd-party iOS data transfer app could help you easily transfer music from iPod to iPhone without iTunes, therefore you could transfer all music files and keep music library in target iOS device not erased. 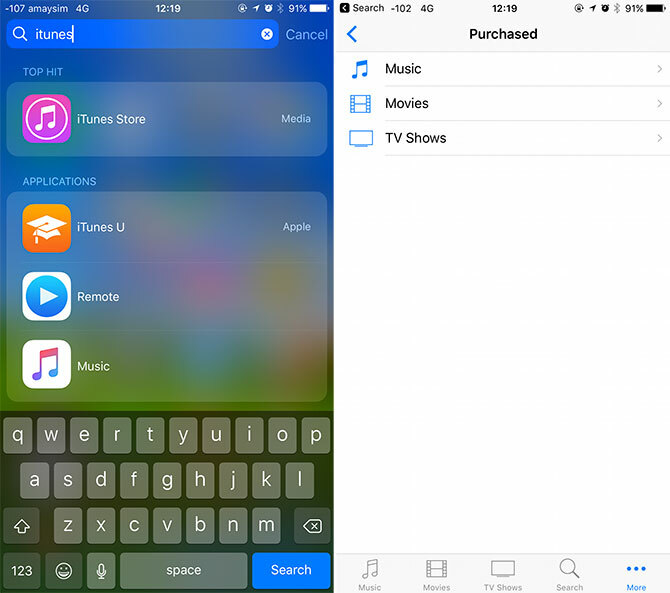 Among all the iOS transfer programs, Leawo iTransfer supports to transfer files without iTunes. 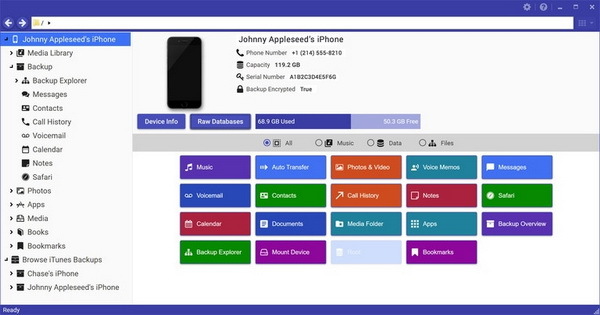 This software is used for transferring files among iOS devices, iTunes and computers. 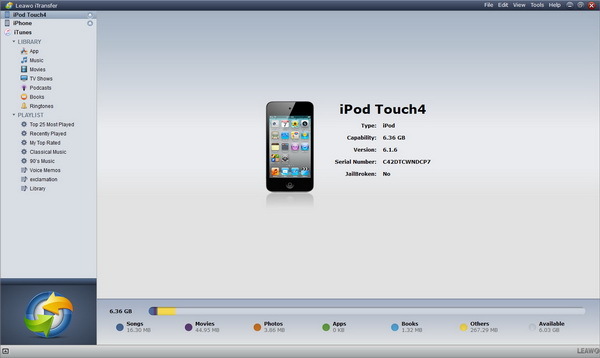 It supports to directly transfer music from iPod to iPhone without iTunes, as well as other 13 types of data and files. Download and install this iTransfer on your computer. 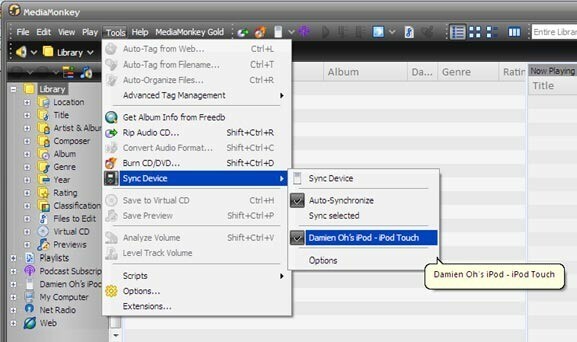 The following guidance will show you how to transfer music from iPod to iPhone without iTunes. Open Leawo iTransfer on your computer and connect iPod and iPhone to the computer via USB cables. You could see your iPod and iPhone devices on the left sidebar. Successively open "iPod > LIBRARY > Music" tab. 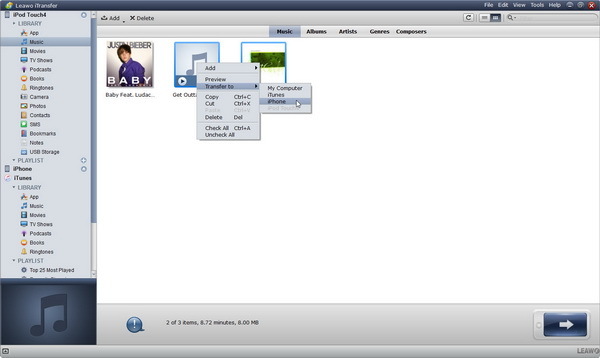 There you could view all music files on your iPod devices. 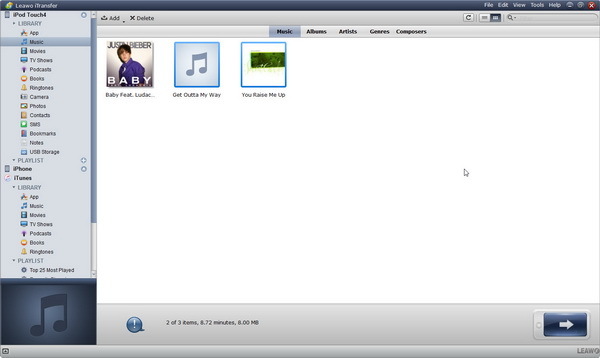 You could preview, play back and delete music files on iPod device. Choose the music files you want to transfer from iPod to iPhone and then right click to choose "Transfer to > iPhone" option. After you choose to "Transfer to > iPhone", Leawo iTransfer would immediately start to transfer music from iPod to iPhone without iTunes. You could view the transferring process. After transferring, you could disconnect your iPhone and enjoy iPod music on iPhone Music app freely. Besides Leawo iTransfer, there are also other iPod music transfer apps that could transfer music from iPod to iPhone without iTunes. These iPod music transfer apps are also user friendly and easy to use. Below we have collected 3 other iPod music transfer apps for you to transfer music from iPod to iPhone without iTunes. You could take a try of them if you need.